Two Turkish village guards were killed and three others wounded when a roadside bomb planted by PKK terrorists exploded on Thursday as their vehicle was travelling in an area near Turkey's border with Iraq and Iran, security sources said. 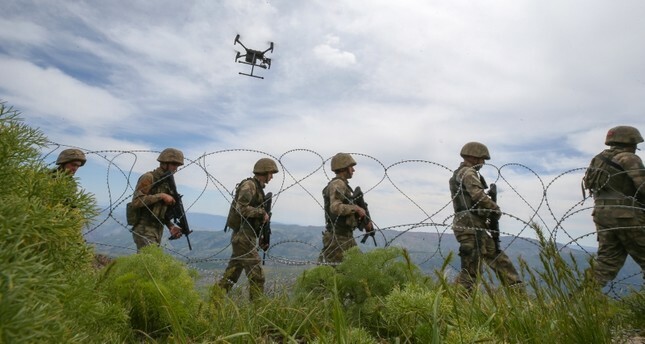 The Turkish military launched an air-backed operation in the southeastern province of Hakkari to capture the terrorist group responsible for the attack. The explosion took place near Kayalar village bordering Iran and located some 45 kilometers east of Şemdinli district center, Hakkari Governorate said. All of the casualties were reportedly from the same family. Turkey's village guard supports the Turkish army in its fight against the PKK in the predominantly Kurdish southeast. The PKK, which has waged an insurgency in the region since the 1980s, has camps in the mountains of northern Iraq, from where it frequently carries out attacks in nearby Hakkari. The group is designated a terrorist organization by Turkey, the United States and the European Union. More than 40,000 people, most of them ethnic Kurds, have been killed in the conflict.